Viewing topic "Connection between XS and Cubase"
I have plugget my Motif XS7 to my PC with USB-cable, I have innstalled the driver and it should be right connected, but I cant get any sound in Cubase! Before I could at least see it was signal on the equaliser-wave who went up when I touched a tone on XS but now I dont get that signal a time. Whats wrong? For help with any computer related problem it is customary to provide information concerning what Computer, what computer operating system… and if you have installed a driver, which driver. This avoids dozens of posts that could simply be solved by checking the versions. Say if after ten posts we discover that you installed the AI Driver when you though you installed the USB-MIDI driver. (I only say this because it happens). Some people install everything new “I installed all the latest drivers"… yikes! Don’t do that...!!! Only install the latest drivers for your particular Computer and computer operating system version. The USB connection will carry MIDI data only. You did not mention how you have your Motif XS7 connected to a sound system. You did not mention if you are trying to record MIDI or AUDIO tracks. “Getting sound in Cubase” could be taken many ways… MIDI as you probably know, makes no sound, MIDI data is only the coded messages that must be played back to the Tone Generator and it must be connected to a sound system. As mentioned the USB cable from the Motif XS7 only carries MIDI data. Thanks for answer long time ago! Yes; I have only connected Motif XS to my PC with an usb-cabel. 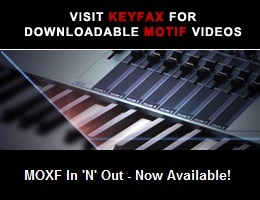 So if I cant record audio from my Motif XS with usb-cable, what equipment do I need to record my Motif XS in Cubase?! If you want to record audio from the Motif XS to Cubase the equipment you need is an audio interface. The role of the audio interface is to send audio data into and get audio back out of the computer and to your monitor speakers. Computer soundcards are a kind of audio interface but most are not sufficient to any thing but the most basic type of recording… The computer comes standard with either an 1/8” mini plug for input and output… or at best RCA jacks. So most Digital Audio Workstation software (liek Cubase) recommend that you get an external audio interface that is designed to do audio. Computer soundcards are sufficient usually only to playback music - as you will have time delays measureable in the 100s of milliseconds… while external audio interfaces use special drivers that bring that down to something in the single-to-teen digits millisecond range. When playing back audio you are not really disturbed if the music starts 375ms after you press play… you may not even notice this as abnormal - it is well under 1/2 a second. But if you are trying to play along with music tracks a delay of 375ms will prevent you from performing… It is simply an eternity to a musician. A simply USB-audio interface like the Yamaha AudioGram3 and the AudioGram6 … you connect the L&R 1/4” outputs of the Motif XS to it and it sends a stereo signal to the computer via a USB connection. The Returning signal traels back to the AudioGram via USB and then you connect the OUTPUTS to your monitor speakers. Of course, to be fair, Yamaha is not the only company making audio interfaces, however, you can count on the Yamaha’s being among the best available. The mLAN16E2 is probably the most economical, convenient and flexible way to track the XS to Cubase and create individual tracks. It is the only multiple output audio interface for the XS and provides pristine 24-bit digital recording at sample rates up to 96kHz. Yes, thanks for good advice! than I think I must try this mLAN16E2! But I dont know witch store I should order this, anyone have any advice which webstore its good to buy it? Where are you based? And from where did you buy your XS7? The first may be crucial since where you are may well open up a different range of possibilities. That said, wherever you bought your XS7 from should also be able to sell you the Mlan16E2 expansion card - make sure you get the one for the XS and not the older one for the ES!!! !